Synlait Milk chief executive Leon Clement says they are happy with the calibre of farmers who are signed up to supply their new factory in Pokeno in the 2019-20 dairy season. Around 160 construction workers are building the $250-$260 million factory in north Waikato, which is about 60 per cent complete. 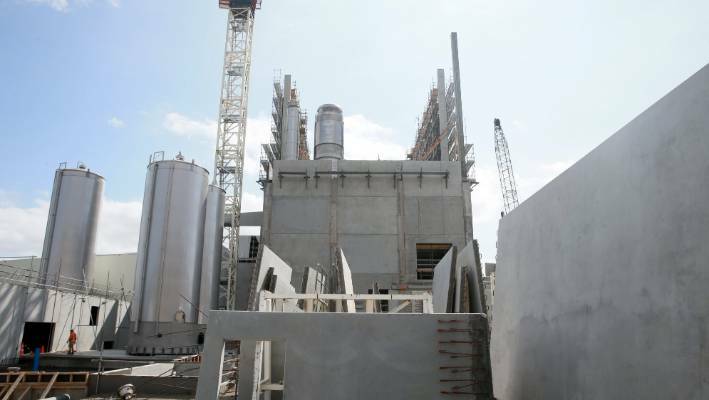 Once finished it will staff 40-60 people and produce 45,000 tonnes of infant-grade skim milk, whole milk and infant formula base powders for the Chinese export market. Synalit Milk's new factory is about 60 per cent completed and will create infant formula powder. Chief executive Leon Clement said they hope to start test running the dryer in August-September in time for the 2019-20 dairy season. Commercial sensitivities mean Clement would not reveal how many farmers have signed up to Synlait, but he said they would be recruiting farmers within a 150-kilometre catchment radius in Waikato. In June last year, Synlait founder John Penno said they would look to secure supply from 80-100 farmers. Clement said they were very happy with the calibre of farmers who they had signed up. "What I can tell you is that we are on track and we are happy with the progress we are making and we are happy with the kind of farmers we are attracting." Farmers signed up for that season will still have their milk picked up before the factory is finished and be traded to another factory in the region and processed there. He said moving into Waikato from its base in Dunsandel in Canterbury was "a bit of an unknown" for Synlait. The region has a deep history of dairy farming and Clement said they were unsure how they would be received. "But we have been really welcomed in the region. People want to see a different approach and they are open to what we have to offer. "We have attracted farmers that we think will be a really good fit for us. They have a similar mindset and way of operating." Many of those farmers have also qualified for Synlait's Lead with Pride programme that earns milk premiums if they meet certain criteria around best farming practice. It incentivises farmers to do better on farm and create a more sustainable business, he said. "It's a great way for them to be recognised and rewarded with what they do." Clement said they had worked hard to reduce the factory's environmental footprint after Synlait pledged last year to reduce its greenhouse gas emissions by 35 per cent per kilogram of milk solids on-farm and 50 per cent per kilogram of milk solids off-farm by 2028. A lack of infrastructure meant Synlait could not install an electroboiler at Pokeno like they did recently at its Dunsandal factory. Instead, the new factory is powered by natural gas. The plant also re-uses the water it extracts from the milk as its plant water supply, further lowering its footprint. The factory sits on a 28-hectare site and Clement said it is large enough for them to expand further if needed in the future. "There's plenty of room for expansion so we can keep adding adjacent dryers or other equipment as we need to."